It’s not very often that I have to use this term, and I do my absolute best to avoid this situation, but playing the roguelike action-RPG Crimson Keep forced me to ultimately ‘Rage Quit’. As someone that is far from shy in playing games from the roguelike genre, I’m always aware of the challenges that beseech these titles, and embrace the perma-death that surely waits. However in the majority of roguelike titles I’ve played, there’s a carrot dangled in front of the player in death that ensures they’ll want to have another go again. Crimson Keep fails to provide this carrot among a bounty of other problems. This is a first-person action-roguelike game with some lite RPG elements that takes place in procedurally generated layouts with semi-randomized enemy placement. Unfortunately almost every element of this game has severe faults that are noticeable immediately within the first area of the game, which ultimately caused relentless frustration and my inevitable ‘Rage Quit’. As an intended roguelike game, you’ll certainly be given an insurmountable death tally given the game’s initial starting area having swaths of enemies that generally within two simple hits will kill your character. However, unlike other favorites in the category, such as Rogue Legacy and Everspace, Crimson Keep doesn’t reward death or even provide a benefit for your new start. At the end of the day, you’re just starting the game over again practically fresh. That is unless you make it through one of the ‘zones’ in which you’re allowed to start from that area. In my twenty odd attempts at the game I was twice able to defeat the first boss, a large ogre, that if I took one large hit and swift kick I was dead (thus my twenty attempts resulting in death here and forcing me through the tutorial section with every new start). However, I quickly found out after finally defeating him and entering the new area was not counted as a new zone. I never made it much further because my victories over that first boss left me injured and immediately entering the new area resulted in a flying poison bat of sorts taking my life in a single hit, resetting me back to the start of the game yet again. I couldn’t turn off the game fast enough, and don’t worry no Joy-Cons were harmed. I find that a good roguelike teases the player with legacy abilities, progressive characters, or even predictable patterns to overcome to seduce the player into accepting death as a reasonable outcome. Here death was like running out of quarters at an arcade machine stacked against you. It would be only sheer luck for you to succeed. Crimson Keep also promotes itself as a first-person action game. While on paper this plan should have paid off fine, you’ll quickly learn of the many technical game flaws that make up a frustrating combat experience. Within the first starting area you’ll find a shield early on, but jumping into combat and attempting to block with said shield results in enemies clipping through your game geometry and still sacking you for critical blows. I averaged roughly 4 out of 10 ‘blocks’ (which was just holding the shield up) that would actually be effective. It was never clear to me how to properly block, and just appeared very buggy in general. Combat continued to feel technically flawed as swinging my axe or sword at close range to a goblin or even larger skeletons would often not register as a hit. At first I thought this was a RNG (random number generator often used in turn-based RPGs) system, feeding into the RPG element of this game, but after playing repeatedly this did not in fact seem to be the case, but rather just non-registering swings. The magic class weapons didn’t fare much better for me either, in that you’ll have to line up a very small reticule quite precisely on an enemy to ensure your magic projectile registers a hit. This is no small feat, and with very limited magic casting ammo, you’ll quickly find you’re in a pinch. At one point I found myself out of all magic mana, unable to actually attack and cornered by the ogre boss. Given that bringing up the inventory doesn’t pause the game, I was unable to swap over to a melee weapon, resulting in my death within the inventory. Rage quit again! 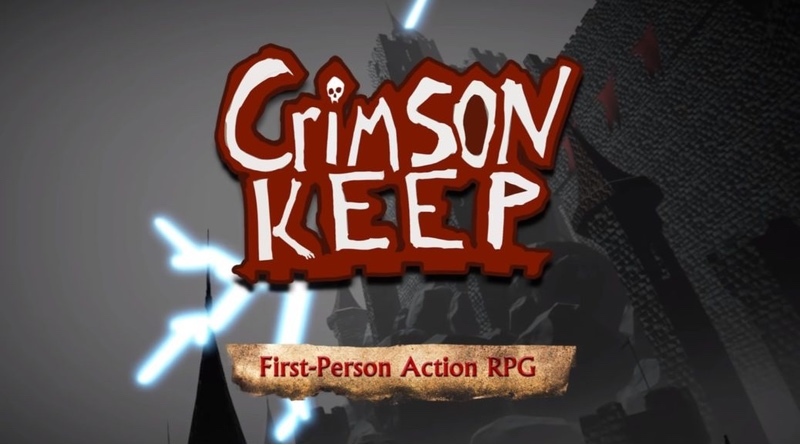 Crimson Keep also calls itself an RPG. There are some lightweight story elements that I found early on, but they felt very disjointed and vague as to what was happening. The game actually doesn’t give much premise at all as to why you’re there or any plot whatsoever. Voice acting quality was also quite subpar, and I found it sounded like it was recorded on something akin to a laptop microphone. There is an inventory system and you’ll go around smashing barrels and defeating enemies in hopes of finding precious loot, but for me it was incredibly scarce and rarely all that useful. I’d collect several apples which helped satiate my appetite, but not my health which mattered far more crucially. When I first accomplished defeating the large ogre boss, I was rewarded with a treasure chest, but disappointingly was simply compensated with my starting hatchet with identical stats again. It was one of the most lackluster boss rewards I’ve ever encountered in a game. A few steps further to the next area and I was slaughtered instantly by those bats again with no better weapon in my hand. Rage quit. Crimson Keep at face value should have hit all the right buttons for a game I would have loved. Games like Ziggurat from the Wii U and PC are a great benchmark for the first-person action-roguelike genre, and immensely fun to play. However for me, this title just missed the mark in every category it aimed for, along with its technical issues further hindering the game. With the unbelievably steep starting area difficulty and lack of incentivized death, clunky combat, and a barebones loot system, Crimson Keep just doesn’t give players that desire to really want to keep playing. If you’re ultimately like me, save yourself the rage quitting experience and spend your money elsewhere.